We rolled out a few simple tweaks the other day on Pluggd.com. We've added an easy to discover RSS link on each podcast detail page that points to the podcaster's RSS feed. We've been so focused on making Pluggd a great web-based listening experience that we left this out. In retrospect this was a bit of a bone-headed move on our part. Some podcasters have pointed out that they don't appreciate it when a web-page references their podcast without a link back to the podcaster's web site (which we did do) and an RSS link for the podcast (which we messed up on). We always appreciate feedback from regular old users and podcasters alike. Thanks. We're in the process of rolling out some more tweaks based on the feedback we've received. This is a classic example of something that is easy enough to add, but a big deal if left out. 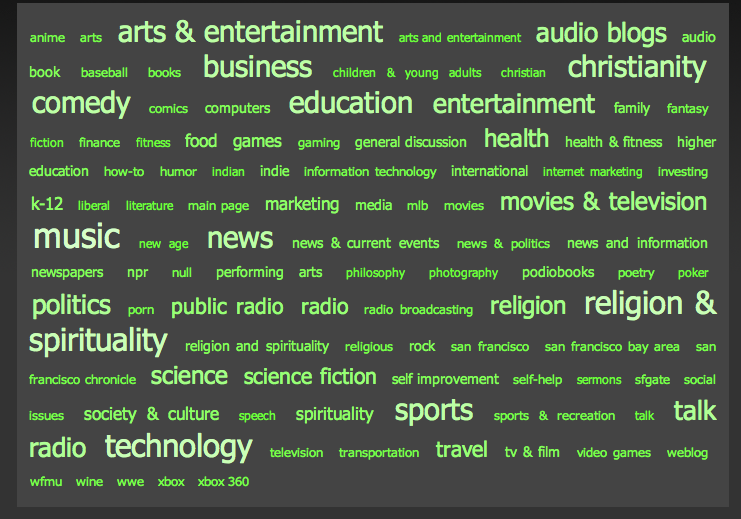 We've also tweaked out tag cloud so it looks nicer. We were not scaling the font size correctly and most of the tags were the same size. This defeats the purpose of even having a tag cloud. Now it looks sweet. Check it out for yourself - http://www.pluggd.com/tag. More tweaks coming soon. Stay tuned. Josh and Chris from the Web 2.0 Show interviewed me about the launch of Pluggd.com. These guys are pretty cool, and they have some nice applications they are making available under the SteelPixel moniker. Pluggd was selected to present at the 2006 Early-Stage Investment Forum organized by the Northwest Entrepreneur Network. A 100+ early stage companies applied to participate in the forum from all over the Pacific Northwest and Pluggd was one of the 25 companies selected to present. So if you are a seed investor looking for some great prospects you should plan to attend this event. The selected companies were required to participate in several coaching sessions where local entrepreneurs who work with NWEN provide feedback on your pitch. This was a good (sometimes painful) experience. Before this, I was mostly interacting with technology industry veterans, but many of the coaches came from different background. This made me realize that I needed to change aspects of my pitch for people who may not have technology industry experience. I also realized that people who have run more traditional businesses can ask a lot of good business questions about a technology oriented company.